Happy 4th of July everyone! I hope everyone (in the USA) has fun plans for today's holiday. Maybe it involves a little time at the sewing machine? Today marks Week 8 (EIGHT!!) 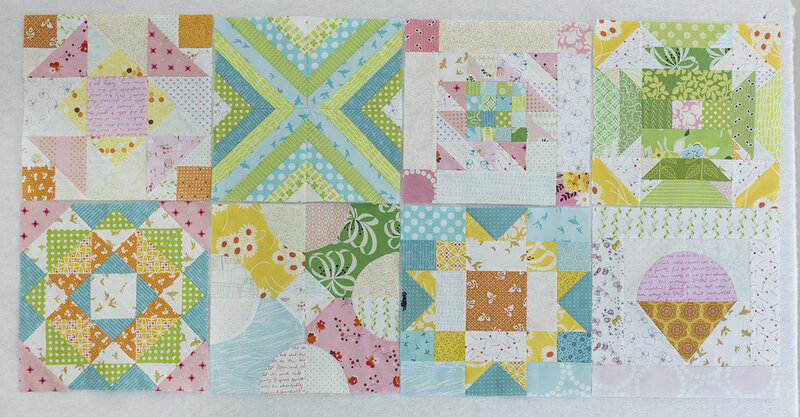 of the Summer Sampler quilt along. This week's block, Deck of Cards, is designed by Lynne Goldsworthy of Lily's Quilts. When I first saw this block, I admit I thought "oh no, a million half square triangles to piece and trim..." :) But then I started reading the directions. The HSTs are made by stitching onto a paper template and then cutting on lines...and magic! Tons of perfectly sized HST units. As a newbie to this technique, I was amazed (and in love)! Here are Weeks 1 thru 8. I'm super happy with how it is turning out! I can't wait to see everyone's Deck of Cards blocks.